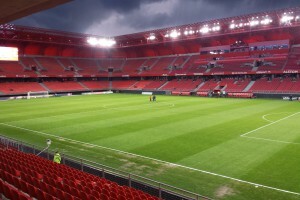 Game: Valenciennes – Ajaccio 2-3 (0-0 HT)Competition: Ligue 1, FranceDate: 22-03-2014Stadium: Stade du Hainaut, ValenciennesAttendance: 14.203Ticket Price: €15,00Terrible quality of football and 0-0 at the break. So I didn’t expect to see anything after the break but all of a sudden both teams started to score. The rather new stadium is worth the visit!